What are the most common objections to using a bicycle as primary transportation? Effort? Exposure to elements? Safety? The inability to haul stuff? These objections may soon be squashed by an ELF. 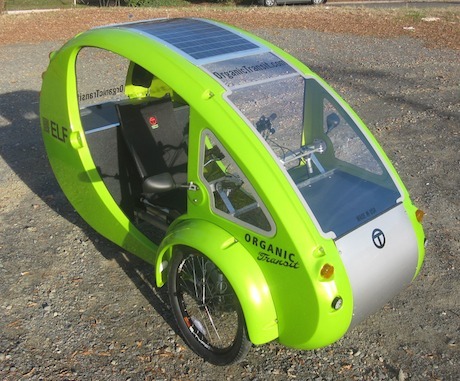 Okay, the ELF is not a bicycle; it’s a badass, category-defying, e-assist, trike that could be an entree for many people into the world of lightweight, low-impact transport. An ABS shell that protects you from the elements (well, not heat and cold, but still). A 600W electric motor than can run 14 miles on pure e-mode. Battery life can be extended considerably with pedaling. A top speed of 20 mph with a 170 lb rider. A built-in 60W solar charger that can fully charge the battery when in direct sunlight for seven hours. Rechargeable in 1.5 hr with conventional, outlet charger. A large, lockable, two-compartment boot. A payload of up to 350 lbs. A total weight of 150 lbs. Three speed internal gear hub or available continuously variable transmission hub for wider gear range. Manufacturer Organic Transport claims the ELF gets the equivalent of 1800 miles per gallon–approximately 1792 mpg more than a Hummer. More than bicycle extraordinaire, the ELF could be a legitimate replacement for small commuter cars. Before you go pedaling your ELF into the future, there are a couple things to know. Starting at $5495, they are about the cost of a semi-decent used car. And if you want to pimp your ELF out, things like carbon fiber hoods will send the price north. This expense might be jolting at first, but if your ELF replaces a commuter car, motorcycle or scooter, the math is easier to justify. Oh, they offer financing. The other issue is that even though the ELF is federally classified as a bike, Organic Transport warns that individual municipalities have their own rules and regulations regarding electric bicycles, which the ELF classifies as. Its capabilities give the ELF moped status in some states and require licenses. Find more info on Wikipedia about your state’s regulations. Lastly, while the motor and boot use a key, locking the ELF requires a normal bike lock. Due to its size, we would imagine it would be tricky to lock on a conventional bike rack. We think the ELF would be great for medium to low density cities like Durham NC, where Organic Transport is located–cities where necessary amenities are just out of of walking distance and lacking crowded bike lanes and racks. The above video imagines such a city, where ELFs (or is it ELVES?) litter Durham’s city streets. As we looked at a couple weeks ago, cars and the houses that require them are one of the biggest hurdles in reducing our damage to the planet. But we can’t wish away low-density, car-intensive housing. So the question might be whether we can live in these places without cars? The ELF creates that possibility, offering a lightweight vehicle suitable for people who want more protection and ease than a standard bike offers. But we can’t wish away low-density, car-intensive housing. ?????? Ummm only people who already enjoy the alternative wish for it. I’d rather masterbate with a handful of broken glass than live in the city. I wonder how it would handle during the winter in MN?